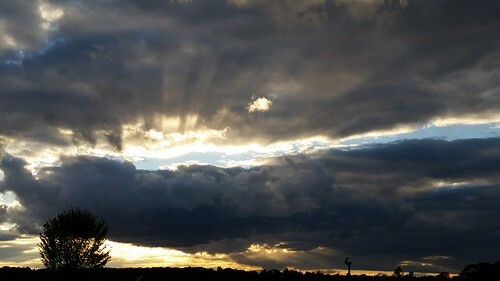 A cloudy sky with the sun breaking through different openings in the sky. When out for a walk, Chris and I spotted this pretty view of the sky. Chris rightly remarked that this is the kind of photo one expects to see on Facebook with some inspirational quote from the Bible or some other profound text. And it's true. The sunlight reaching through with its rays and the dark and foreboding clouds begs for some words on staying steady through hard events. I'm more a fan of the layers of the photo from the black outline of the tree line to the yellows above that where the sun is strongest. From there, it jumps into the dark gray of a cloud that nearly covers left left to right because the blue sky break and more dark clouds sprinkled with sun rays.